Business Tip #6: Be Proactive. Listen to the first few seconds of this album: if you didn’t look at the cover, many would swear it was Oasis. Writing to Reach You‘s opening chord progression is identical to Wonderwall (a pattern Green Day would also borrow a few years later with Boulevard of Broken Dreams). 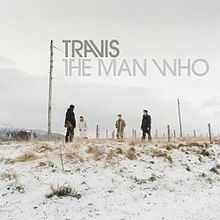 For a minute, I was tempted to dismiss Travis as copycats, blatantly guilty of plagiarism. And then they swept me off my feet. Critical ammunition depleted, the listener can now sit back and enjoy. If not the most exciting, this is an undeniably beautiful record, featuring some of the better choruses in recent memory. Writing to Reach You is gorgeous, as are Driftwood, Turn, and Why Does it Always Rain On Me?. The latter benefitted from fortuitous timing: on an otherwise sunny day at the 1999 Glastonbury Festival, the rain came started coming down just as Fran began singing the first line. To quote Alicia Silverstone, I totally paused! That was one of the all-time great office moments – maybe enough to temporarily put season 2 ahead of season 3 for best season!